This course offers participants a comprehensive overview of how to prepare for, and best position your company, when customers become financially insolvent or enter into bankruptcy. 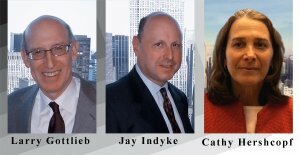 Your instructors are 3 principals from the nationally recognized law firm of Cooley LLP: Larry Gottlieb, Jay Indyke and Cathy Hershcopf. Cooley LLP has represented creditors’ committees in many large firms and debtors in successful reorganizations. This presentation is organized into 7 video sessions with a total runtime of approximately 5 hours. Each session is followed by assessment tests designed to prepare participants for the final exam. Protecting and Elevating Claims – The Claims Waterfall, Critical Vendors, Goods in Transit, Credit Insurance, Letters of Credit, PACA/PASA/PPFPA Claims, Consignments and Purchase Money Security Interests. Material Case Events – Creditors’ Committees, Notices and Case Monitoring, Capital Structure Issues, Financing, Cash Collateral and the Budget, Automatic Stay, “363” Sales, Affirmative Litigation Strategies and Preferences. Contracts in Bankruptcy – Enforceability of Agreements in Bankruptcy/Ipso Facto Clauses and Executory Contracts. General information regarding Claims in Bankruptcy and Claims Trading. Case Exit Strategies – Sharing a Piece of the Bankruptcy Pie, Creative Ways to Provide Distributions to Creditors, the Plan and Disclosure Statement Process, Important Plan Creditor Protections, and Conversion to Chapter7. Cross Border Issues – Laws Pertaining to Canada and Working with U.S. and Canadian Courts. Outside of Bankruptcy – Prepackaged and Prearranged Bankruptcy Filings, Out of Court Workouts and Collective Creditor Action/Insolvency Filings.